Quilting and sewing both take a pattern, and even if you do not want to deal with the complexity of making a garment pattern, a quilting pattern is much easier to design your own. Of course a square is easy enough, like for this Trip Around the World quilt shown, but there are other quilt patterns or templates you can make, too. Grandmother's Flower Garden is an old quilt pattern made with hexagon shapes, but if you purchase a pattern, you will only get one size. We have instructions in an older blog about how to make a flower garden quilt block in any size you choose. 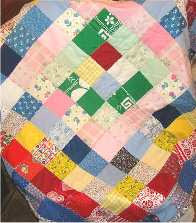 Have fun with a new year quilting project, and make your own pattern. 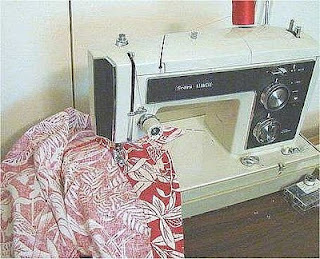 Sewing is a great hobby, but it is also a frugal living activity in the American home. Learn to sew for the new year, or learn to sew better than you can at the present time. Sewing can include mending and alterations, too. We sew, quilt, and do crafts projects on the sewing machine, but our machine has paid for itself many times over with the mending and alterations for the family and friends. We hope you can enjoy the pleasures of sewing this year, either in learning to sew, learning to sew better, or making time to sew more. You don't need a fancy sewing machine to make beautiful crafts or clothing. We hope you have a great new year and that sewing becomes your favorite pasttime. Learn to cross-stitch like a pro. Even if you think you can cross-stitch, there are techniques that will help you make uniform stitches with cross-overs going all the same way, and to help keep you from losing your place in the pattern. You can learn to cross-stitch so your work looks professional, and just like the ones you see in the crafts magazines. It is not difficult, but takes just a little know-how. The key to cross-stitch is to make all the crosses run in the same direction. If you work from right to left, do half-cross stitches across and the top half cross stitch from left to right. This will always keep your second half on the top running from left to right. The look is professional! We have been cross-stitching for at least thirty years, and it was a surprise to us that our early cross-stitching work now looks elementary. Before counted cross-stitch, we did stamped cross-stitch projects, and they were often stamped poorly or not lined up with the grain of the fabric. This helped contribute to the "elementary" look, but cross-stitching in rows going one way only probably helps the most to have uniform stitches, and cross-overs all going in the same direction. It makes a difference. We hope you have time for crafts during the holidays and that you have a wonderful holiday time with love and peace. 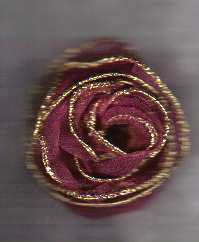 Craft a wire ribbon rose or flower for packages or for home decor. Wire ribbon is a great product! This flower takes about 36 inches of wire ribbon and just a few minutes to make. Start at the end and pull some of the wire out to ruffle the ribbon and to give you wire to tie the flower as you go. Roll the ruffled ribbon tight for the center and looser as you move to the outer edges. Wrap with the wire as you go so the center does not spring loose. Tie off with wire at the end. Make a few of these flowers for your packages, or let your kids make them. They are that easy! Sew gift bags of fabric this year for any occasion. They are easy to make and are an additional gift to the recipient. Gift bags can be made of scrap fabrics in any size, but about 8 x 10 inches is perfect. You may use a purchased bias tape or just make a double hem on the inside of the bag to run a cord through, and decorate the bag to suit the occasion or the person. If your sewing skills are minimal, you can still craft fabric gift bags that can be used for years to come. You have time to make these for Christmas, but they are also great for Valentine's Day, weddings, birthdays, and other holidays. Bags can be made large enough for a bottle or even a santa pack, but the size we use frequently are the jewelry bag size. You may even have some coin bags you can adapt to gift bags--like the one shown in the picture. 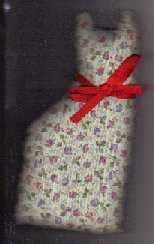 Make a fat cat Christmas ornament quick and easy with chintz fabrics or with satin if you prefer. You will need some fabric scraps, scissors, a needle and thread and maybe a sewing machine, and something for stuffing. Ribbon adds a hanger. You still have time to make these for your Christmas tree or for accents on the table or mantel, or for the kids to find in a Christmas stocking. They also look great in a basket with several different ones. There is no face, and both sides look alike except the bow. We hope your Christmas projects are progressing and that you have time to make crafts and share the joy. 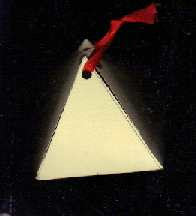 We do a few crafts projects that are not needlework, and one of the fun ones kids like are the triangle treasure boxes. These are Christmas ornaments, or gift boxes, or both, and are easy to make. They can be decorated by children, or with gift wrap paper, or with fabric and lace. The sample box we have here is made of a manila file folder, and it will hold small wrapped gifts like jewelry or candy, and will hang on the tree. The triangle treasure box can be a re-usable ornament or gift, too, since the ribbon can be tied to be opened. The basic pattern for the triangle treasure box is a square with four triangles on the sides. The decoration ideas for a needle crafter are endless, since the manila folders allow sewing, glue, fabric and lace, beads and sequins, or make the box from a printed Christmas box. We hope you are making lots of fun crafts for the Christmas season! See you with a new project in a few days. Christmas stockings are fun and easy to sew, and you can make several different ones with scraps of fabric and few accessories. 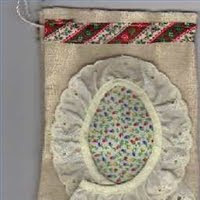 We have made several Christmas stockings this Christmas season, and are always pleased to share ideas and instructions. Fleece is a great fabric to work with, and most kids like the feel of it. 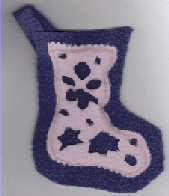 We have also been making cowboy western Christmas stockings from denim fabric. This pattern works well for mini Christmas ornaments to hang on the tree. Can you stand one more? 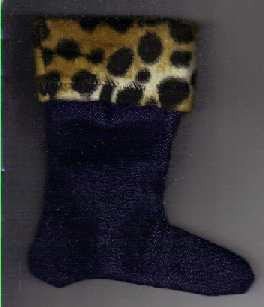 Here is our frugal living Christmas stocking. If you are like us, you have more fingertip towels than you can use in this lifetime. We use ours for sewing projects, and you won't have any difficulty figuring out how to make a stocking from a fingertip towel. If you have one with fringe or a nice edge, turn that edge to form the turn-down top for the stocking. We hope you try some of these easy crafts for Christmas. We like to share! If you like crafts but do not sew, there are still lots of fun crafting projects you can do for Christmas. 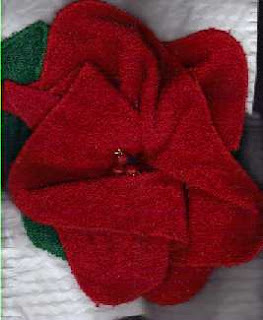 We make poinsettia flowers from red and green washcloths, and they require no sewing. This is our original crafts project, so you will probably not see it elsewhere. You will need two red washcloths and a green one for each poinsettia you want to make. You will also need a large rubber band and something for the center berries. Fold the washcloth so the corners show. Add another red washcloth with alternating corners. Fold the green washcloth in thirds diagonally. Add the green washcloth to the back with two ends showing. Place a rubber band on the back by twisting the washcloths in the center of the back. Place a package decoration berry or similar item in the center. We hope you are making lots of Christmas crafts!